Stunning beautiful divas and handsome demi-gods descended from the world of fashion, music, cinema, television, arts and high-society to a glittering annual fundraising gala at the Metropolitan Museum of Art, Costume Institute in New York on the 7th of May 2018. 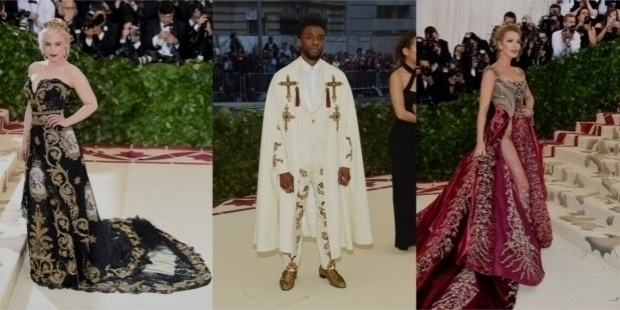 ‘Heavenly Bodies: Fashion and the Catholic Imagination’ was the theme of Met Gala 2018. The iconic-styled event has become larger-than-life in the world of fashion. Fashionistas mark their presence to showcase their creative flair and bold stature in donning the stupendous and most outrageous outfits to impress the eagerly watching world. The individual, who stands out among the 1000 plus guests of the evening, becomes the ‘talk of the world’. The celebration opens the door for the Costume Institute’s annual fashion exhibition from the 10th of May 2018. 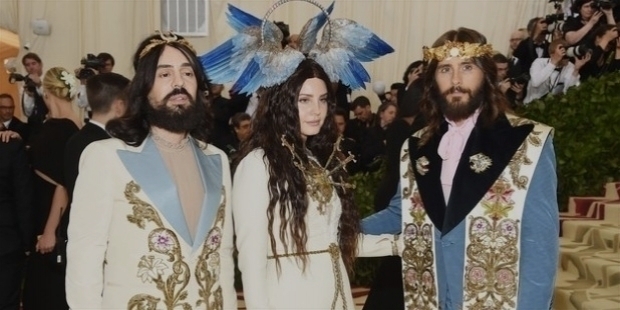 This year, Met Gala theme is ‘Heavenly Bodies: Fashion and the Catholic Imagination’. It is interesting to note that more than 40 papal vestments were lent by the Vatican Catholic Church. Cardinal Timothy Dolan made his conspicuous presence at Met Gala 2018. Sweeping the red carpet with their grand entrance, the divas spellbound the crowd in awe, ecstasy, envy and joy. Rihanna stunned the world with her papal mitre bishop look. Looking resplendent, she wore the perfect look true to the thematic expression and creation. 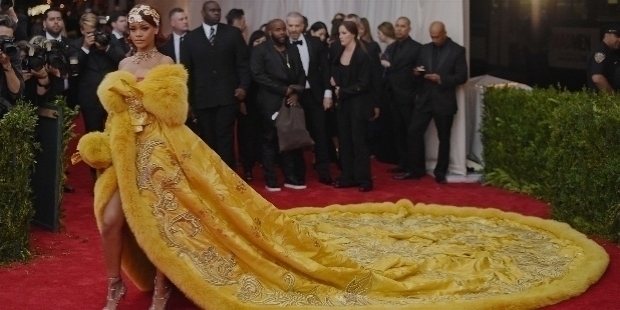 Each year, a committed Rihanna works hard to impress the crowd with her fashion statement at Met Gala. Psalm 96:9 ‘Adore the Lord in holy attire’ were creatively adhered to, by 500 plus bold-faced actresses, musicians, models, designers, businessmen and editors. Katy Perry followed the Isaiah 6:2 ‘a humble imitation of the angels’ behaviour, who when they sang the praises of God, and adored and glorified his perfections, covered their faces and their feet with their wings’, flaunting her enormous pair of feathered wings, spanning six feet. Her Versace golden chain mail mini-dress and thigh-high boots perfectly matched her super angel look. Ever since the ‘Queen of Pop’ Madonna hit the music scene with ‘Like a Virgin’ in 1984, she had, she has and she will always forever epitomize the Catholic look, to set her own trends for others to follow. Her surprise performance enthralled the exhilarating gathering. Madonna paired her net veil over her face with a regal black Jean Paul Gaultier gown. Her trademark jeweled crucifixes and rosaries were, as always, in their right places. 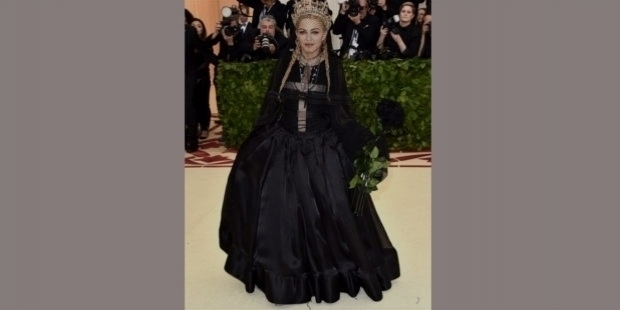 Madonna appeared in a monastic cloak post-dinner and descended the stairs to make her entrance on the stage with the tolling sound of church bells. Mellifluously she sang ‘Like a Prayer’ and transitioned with Leonard Cohen’s ‘Hallelujah’. After the scintillating performance, Madonna walked through the crowd and rising suddenly above guests she shutdown the gala to a thunderous applause and cheer. The magical moment will live forever in millions of hearts around the world. Clooney and His Eminence Timothy Cardinal Dolan introduced the Sistine Chapel Choir. The surprise concert by the choir was one of the highlights of the evening. The celebrity attendees became works of art themselves in their creative outlandish outfits, especially designed by renowned designers for the ‘evening of the year’. In the Met’s iconic spaces, director Bardia Zeinali brought dancer Mette Towley along. The divine combination of the duo inspired the guests to groove to their moves. Showcasing precious Vatican artifacts and turning part of the Met Cloisters into a refurbished monastery, this year’s Costume Institute spring exhibition is one of its most ambitious efforts till date. Vogue paid homage to the museum’s incredible collections in extreme style at Met Gala 2018. The red carpet was the centre of attraction for one and all – be it the celebrities flaunting their creatively designed costumes of the evening, or else the ready-to-capture paparazzi, or else fashion aficionados watching with keen eyes. The theme was being interpreted in one’s own tastes, dreams and unfulfilled desires. The Metropolitan Museum of Art’s Costume Institute gala was hosted by Rihanna, Amal Clooney, Donatella Versace, Dame Anna Wintour, and Stephen and Christine Schwarzman. British Museum curator and current Head Curator of the Metropolitan Museum of Art's Costume Institute in New York City Andrew Bolton did a fantabulous creative job. ‘Heavenly Bodies: Fashion and the Catholic Imagination’ exhibition was opened to public from the 10th of May 2018. Spanning 25 galleries and 60,000 sq ft, the exhibition is the museum’s largest and most ambitious efforts so far. Andrew Bolton, the show’s Chief Curator stated, “Met Gala 2018 is intended to evoke, both the concept and the experience of, a religious pilgrimage.” Awaiting fashion’s finest pilgrims, gleaming treasures on loan from the Sistine Chapel sacristy, many of which have never been seen outside the Vatican, became the highlights of Met Gala 2018. Designs by Rick Owens, Ann Demeulemeester, Lanvin, Viktor & Rolf, Thom Browne, Chanel, Yves Saint Laurent, Maria Grazia Chiuri and Pierpaolo Piccioli of Valentino, Riccardo Tisci, Madame Grès, Thierry Mugler, Roberto Capucci, Dolce & Gabbana, A.F. Vandevorst, and Rodarte are included in this year’s exhibition. Formally called the Costume Institute Gala, the Met Gala or the Met Ball is an annual fundraising gala for the benefit of the Metropolitan Museum of Art's Costume Institute in New York City. The gala marks the grand opening of the Costume Institute's annual fashion exhibit. The event celebrates the theme of each year's Costume Institute exhibition. The exhibition sets the tone for the formal dress of the night and selected guests are expected to choose their fashion to match the theme of the exhibit. Met Gala is regarded as one of the most exclusive social events in New York. It also happens to be one of the biggest fundraising nights in the city. The notable source of funding for the Institute through Met Gala is one of the largest sources. The grand evening is attended by personalities from the arts, fashion, high-society, film, and music. 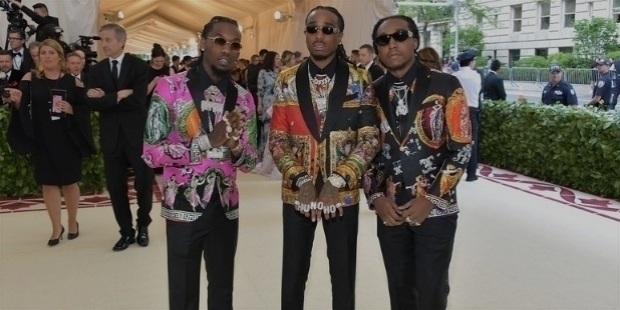 Met Gala is the fashion industry's premier annual red carpet event. From 1995, Dame Anna Wintour, Vogue Editor-in-Chief and a Chair of the event oversees, both the benefit committee and the guest list, for the evening. The annual guest list includes only a select few of 650 to 700 renowned and powerful celebrities from the fashion, art, music, cinema, high-society, business, television and the modelling world. Each year, a theme is announced for the guests’ list to adhere to their creations. Guests arrive to walk on the red carpet during the cocktail hour, tour the year's special themed exhibition, and be seated before the dinner party. The dinner party includes entertainment from the distinguished entertainers of the evening. Katy Perry’s gold Versace chain mail mini-dress, thigh-high boots and giant feathered angel wings, spanned six feet.